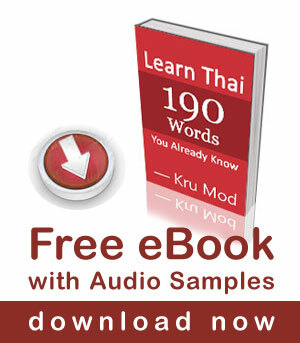 Thai has many more personal pronouns than English; age, social status, gender, the relationship between the speakers, the formality of the situation and individual personality all play a part in helping a Thai to decide the most appropriate way to refer to him/herself and address and refer to others in any situation. Kin terms such as dad, aunt, child status/occupation such as teacher, doctor and personal names or nicknames are also commonly used as personal pronouns. I prefer to call myself by my nickname, Mod when I speak to everyone except freinds. Click here to learn more about pronouns “I”. Click here to learn more about pronouns “you”. I am studying on this Pronoun lesson extra. I learn some very important new things today. I always seem to learn how say I love someone first in an language. This lesson is really helpful. Choke Dee. Kob kun ka.